The Amazing Acrobats of Shanghai is one of the most heart-stopping shows in Branson that feature the all-new Shanghai Circus at the New Shanghai Theater. This multi-talented acrobats from China brings a dramatic interpretations of traditional and classic Chinese dances and thrilling performances. This group of over 40 talented acrobats from Jinan, China always impress audience with their amazing acrobats and stunts. This thrilling entertainment of New Shanghai Circus is one of the best shows in Branson that features vibrant display of awesome acrobatic acts and jaw-dropping stunts that will make you wonder how they perform amazingly such thrilling stunts and with so much grace. Their fantastic performances include Pole Climbers, Aerial Fish Ballet, Hoop-Diving, and so much more. This Shanghai acrobatic Show features a colorful and authentic costumes that perfectly harmonize with their thrilling act that display expertise and bravery of every acrobat featured in the amazing circus show. The state-of-the-art lighting and sound effects and the use of thrilling musical accompaniments and stunning backdrops that work so perfectly will dumbfound everyone in the audience. The fantastic show of talented acrobats is such an electrifying performance that the entire audience will truly admire. The historical and cultural displays of Acrobatic Acts from China all throughout the show entertain audience continuously with graceful and colorful acts of traditional Chinese stunts, dances, and amazing acrobatic feats. Some of the amazing stunts of the Acrobatic Acts from China that you’ll see include a Bicycle balancing act, Chair Stack, Diabolo, Adagio, Butterfly Lovers, dancing Dragon and playful Lion dances, and many other thrilling acts. From fantastic aerial displays to beautifully choreographed routines featuring amazing acts such as Jar Juggling, marvelous spinning plates, lasso fun, incredible hoop-diving, these acrobatic acts from China is sure to have you coming back at some other time. This great show of amazing acrobatic acts and stunts is the perfect addition to a wonderful vacation in Branson, so make it sure to bring the entire family to enjoy wholesome fun and excitement of the amazing acrobatic performances of the New Shanghai Circus. The Amazing Acrobats of Shanghai is one of the most popular shows in Branson that delivers an exciting and fast-faced production showcasing classic Chinese dance and unique physical performance act. 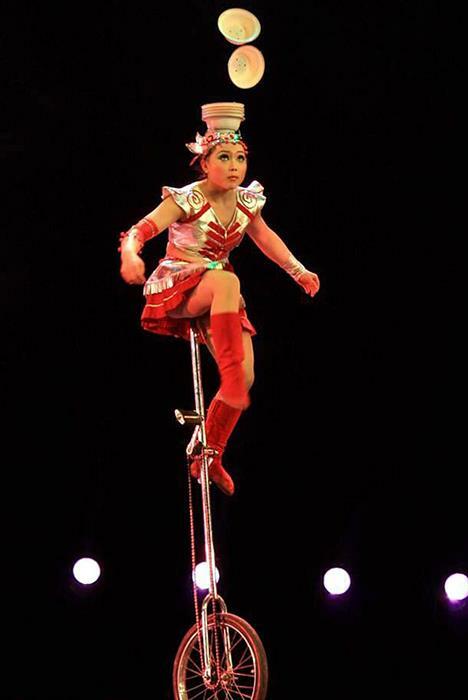 Every year the New Shanghai Circus in Branson brings different acrobatic troupes from China. This year’s group offers a spectacular show of dazzling acrobatics, elegant eastern dance, amazing human strength and beauty, and more. The FenMo Acrobatic Troupe from Jinan, China will be performing at the New Shanghai Theater this season to show their award-winning skills, colorful costumes, and playful performances. Such a great show for young and adult audiences alike. The amazing performances of talented acrobats at the New Shanghai Circus truly gives a unforgettable experience for everyone. You’ll surely be on the edge of your seat once these talented acrobats show each other’s amazing feats with traditional and classic Chinese performances. The Acrobats of Shanghai featuring the New Shanghai Circus at the New Shanghai Theater is a wonderful show in Branson that features continuous line-up of amazing acrobatic acts and stunts.